Leah is an Accredited Practising Dietitian (APD) and Accredited Nutritionist (AN) with over 15 years of experience working exclusively with children and their families. She has enjoyed a varied career, working at the Sydney Children’s Hospital, Randwick and in private practice. Her expertise includes managing general childhood nutrition issues such as fussy eating, growth faltering and weight management through to managing complex therapeutic diets. Here, her caseload has included diabetes, endocrinology, inborn errors of metabolism, neurology, neuromuscular disease, ketogenic diets for epilepsy, neonatal nutrition, surgical cases, feeding clinic, oncology, and renal disease. 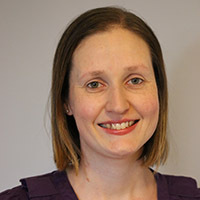 In recent times, Leah has been the clinical educator in the department and is passionate about student education as well as supporting and mentoring colleagues. Leah has volunteered as an APD mentor over many years, guiding new dietitians’ first steps into the world of dietetics. Leah believes that optimal nutrition is vital for children’s health and development now, and throughout their lives. Children have unique nutritional requirements that are best managed by an experienced Paediatric Dietitian. As a parent, she understands the challenges faced by parents and aims to provide a family-centred, food-based approach to help children of all ages achieve their nutritional goals.